This morning, joined by over 3,000 other runners, I took to the streets (and causeways) of Miami Beach for the inaugural race of the Rock & Roll Marathon Series (aptly renamed for Miami as the Latin Music 1/2 Marathon). It was a beautiful race course beginning on Miami Beach's Ocean Drive and ending on the sands of the beach. Temperatures in the upper 70s, high humidity, occasional wind, decent spats of rain, and the four bridges, made for a challenging, yet exciting and fun day. My cousin and I arrived on the Beach at about 6:00am, found a great parking spot, and began our pre-race preparations. Setting up at the car was when we first noticed the throngs of SoBe partyers who hadn't yet gone home after a night out. Several years ago, that might have been me, but instead here I was lacing up, getting ready to give it my all for 13.1 miles. We took an easy jog to loosen up, dodging packs of staggering drunks, who seemed fascinated by our presence. The next order of business was to find a place to do our business! We knew there would be portalets at the race, but honestly who wants to mess with that. We debated which store we should attack and settled in on Pizza Rustica; a place where I'd spent many a late night grabbing slices during my formative college years. While the smell of the street out in front (and their bathroom) was nowhere near what I experienced on my long run through New Orlean's Bourbon Street several weeks ago, it was most certainly pungent. We hurriedly did what we had to do and made our way to the starting corrals. This was my first race with corrals (based on pace) and I was amazed at the difference it made. My other events have mostly been short runs which have congested starts and often remain congested throughout the race. We found our place in Corral 2 alongside a coworker's husband (who recently completed his first NY marathon) and made some small talk until the starting gun. Corralled and ready to go! It was apparent from the start that today's runners were much better at pacing than those at the 5k and 5m races I'd done. At those events hordes of runners charge out at the beginning, only to fade immediately thereafter and clog the course up for everyone else. Things were much more comfortable today which made for a much more pleasant day. With my cousin at my side I mostly stuck to my pacing plan for the first 8 or so miles and I felt great; my body working hard for sure, but it was totally sustainable. As always the bridges were challenging, but all in a day's work. Between miles 8 & 9 we said our goodbyes and I settled in for the final 5 miles. I was able to maintain pace, with only one minor slowdown as I tackled some rain, the final bridge, and some unexpected wind. I was hoping to run the final 5k a bit faster than I did, but I think minor dehydration held my body back. Regardless, I plodded on, encouraged by the fact that I was continuing to pass tons of runners along the way. An additional boost came from fellow Loco Andrea, who once again brought her great cheerleading charisma; this time with about .15m remaining. I kicked it into high gear and busted it the rest of the way to the finish line, using every bit of gas left in the tank. 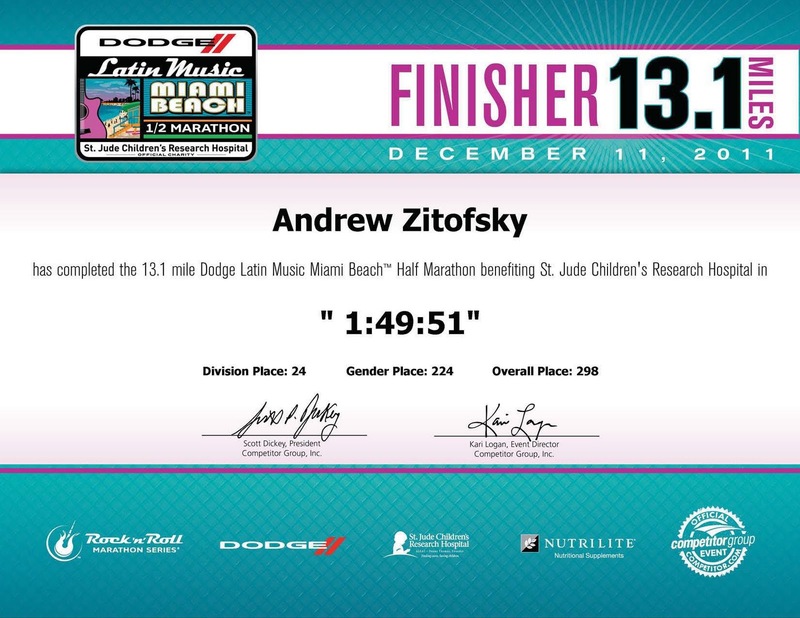 I'm really happy with my time and places among the other runners. 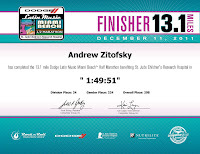 I refuse to use the phrase PR, because this was my only R for a half-marathon. Now I have a time to beat for my race and pacing to guide my future training. For this year I have one more race on the calendar: the Down2Earth 10k trail run at Oleta Park. After that it will be odd to have no currently scheduled races (except of course for IMAZ 2012), but I'm sure that will change before too long!